One of the goals of APlusPhysics.com is to provide students with the resources they need to be successful. As I'm sure you can all imagine, as educators we struggle with finding ways to set our kids up for success. And today's students face a wide variety of challenges that hamper their ability to learn through traditional means. Students who aren't in attendance, for reasons that may range from illness to family issues to special needs, are immediately at a disadvantage in technical classes in which content continues to build throughout the year on an ever-expanding foundation. Throw in the challenges of large class sizes (I'm outnumbered by students close to 100:1), and regardless of how much time I'd like to devote to each of my kids, there's no way to meet everyone's needs all the time. Toward this end, APlusPhysics is designed to provide a "home base," of sorts, for all students to begin to learn to teach themselves. The forums provide an opportunity for discourse and an online student-supported "help desk," of sorts. Plus, any time you can get a student writing about what they know, they're solidifying their understanding and building critical thinking skills. If you can get them to teach others while they're at it, you've really built something special. The blog portion of the website is a great way to get students to develop their metacognition, writing about what they do and don't understand, creating an ongoing journal of their learning. It's also a great way to get them to really think about the essential questions in physics, organizing their thoughts to develop "big picture" conceptual understanding of what they're learning, and why. The main website, under continuous development, houses key material central to each of the supported physics courses. I started my work with the NY Regents Physics Curriculum, first, because I teach multiple sections of that course each year, and the material I develop is directly useful to the majority of my students, and secondly, it's the simplest of the physics courses I teach, which provides a terrific sandbox for me to grow my web development skills, hopefully limiting my struggles to the technical side of web building. Since then, the material has continued to pile up, with courses ranging from Regents/Honors physics all the way to calculus-based physics, with supporting videos. As the site became more and more popular, I began receiving requests to build out various sections and provide more materials. Repeated requests for the web tutorials in printed form led to the first APlusPhysics Regents book, which was written as the book I would have wanted as a Regents Physics student. It wasn't, however, the book covering the curriculum I really wanted to teach. The Honors Physics Essentials book, on the other hand, covers the curriculum as I would teach it if I weren't constrained by our state-mandated curriculum and end-of-year tests. Next came an organized set of worksheets based on the last 17 or so Regents Physics exams. I initially put them together for use in my classes for review, but shared them with a few other teachers, and they quickly grew popular, so I put them on the web. Then came the requests to make it even easier and put them in a print edition -- this became the Ultimate Regents Physics Question and Answer Book. As I became more comfortable with the flipped classroom model, I then started work on a book for the upcoming AP Physics 1 and 2 courses... flipped class videos, and supporting books designed not as a "one-stop shop" for everything you need to be successful on the AP-1 exam, but rather to provide an introduction to the required content, formulas, relationships, and concepts needed to be successful on the exam. Appplication and true understanding of the concepts require hands-on work, discussion, problem solving, frustration, and instructor guidance -- all of which are MUCH better handled in a classroom than in a book. The AP-1 and AP-2 books, therefore, are written as the paper equivalent of a flipped classroom video -- providing the basics that can be handled outside of class time, leaving more class-time for the active learning activities so vital to success. The AP Physics C Companion: Mechanics was written as a guide book to assist students in their studies as they work through the course, though it is also useful as a year-end test prep guide. Finally, I want APlusPhysics to be a repository of materials for educators to share the best of our ideas, activities, challenges and successes. The Forum already has an Educators Only section, but I also want to populate the website with activities we can use to bring physics to life for our students, encompassing everything from projects and challenges to mini-programs such as the Semiconductor Technology Enrichment Program (STEP), providing students an introduction into the world of semiconductors, a discipline quite regularly neglected in high school educational communities despite its profound influence on our daily lives. I've also recently added a "Community" section where students and educators can share files (Downloads sections) and videos to assist in creating an active, effective, engaging learning environment in the classroom. So with that, allow me to welcome you to APlusPhysics! APlusPhysics.com is the creation of Dan Fullerton, in much-appreciated collaboration and conjunction with educators and contributors from a variety of backgrounds. Fullerton holds both bachelor of science and master of science degrees in microelectronic engineering from the Rochester Institute of Technology, where he was president of Kappa Delta Rho, Iota Beta Chapter. He has completed the Imaging Science Career Development Program at Eastman Kodak Company, a 600-hour corporate graduate program in imaging science, as well as secondary physics education certification from Drexel University. Fullerton began his professional career as a research scientist in Eastman Kodak's Research Labs, focusing on plasma processing and thin film optics, before migrating to mass microchip manufacturing in starting up Samsung Austin Semiconductor's Fab 1 in Austin, Texas. Following several years at Samsung, Fullerton returned to Eastman Kodak as a diffusion and LPCVD engineer, completing his master's degree and the Kodak two-year Image Science Career Development (ISCD) program before assuming management responsibilities as head of the Thin Films Engineering Group in Kodak's Image Sensor Solutions. In 2003, Fullerton joined the faculty of RIT's Microelectronic Engineering department, teaching the undergraduate course "Microelectronics Processing III" and the graduate course "Thin Film Processing" as an adjunct professor, including both online and on-campus sections. Following several years in Thin Films at Kodak, Fullerton accepted a promotion to head the Packaging Engineering Group at Kodak as a change of pace. By this time, however, the teaching bug had sunk in, and in 2008 Fullerton accepted a full-time position as a physics teacher at Irondequoit High School in Rochester, NY. He was named a New York State Master Physics Teacher in 2014. Educational interests include teaching for transfer and understanding, integrating technology with education, and bringing semiconductor education into the high school lexicon. APlusPhysics.com is a tool aimed at furthering all of these interests. His journey into the world of high school physics teaching is chronicled on the blog Physics In Flux. Personal interests include volleyball, piano, guitar, writing, and, of course, his family. Follow Fullerton on Twitter: @aplusphysics and the APlusPhysics Facebook Page. Fullerton, Daniel B., "DC Reactive Sputtering of Transparent Conducting Indium Tin Oxide." Senior Project. 15th Annual Microelectronic Engineering Conference (AMEC) Archive. Rochester Institute of Technology, 1997. Print. Fullerton, Daniel B., "Process Development of a Novel Pseudo Two-Phase CCD Pixel Using Transparent Conducting Oxide Electrodes." Thesis. Rochester Institute of Technology, 2003. Print. Fullerton, Daniel B. (Penfield, NY, US), Summa, Joseph R. (Hilton, NY, US),	2004,	Method for Creating a Double Transparent Electrode Pseudo Two-Phase CCD, United States,	Eastman Kodak Company,	20040092058. Fullerton, Daniel B., 2004, Microelectronics III (0305-703-90), RIT. Kurinec, Santosh; Ewbank, Dale; and Fullerton, Daniel; et. al., "Online Master of Engineering Program in Microelectronics Manufacturing Engineering: A Valuable Resource for Engineers in Semiconductor Industry," 9th International Conference on Engineering Education, San Juan, Puerto Rico, July 2006, TIA1-5. Jackson, Michael A.; Lewis, Elaine; Fullerton, Daniel; et. al., "Integrating Semiconductor and Nanotechnology Fundamentals into a High School Science Curriculum Module," 40th ASEE/IEEE Frontiers in Education Conference, Washington, D.C., October 2010, Session T2E. Noschese, Frank; and Fullerton, Dan, "Trolling the Physics Teaching Blogs," The Physics Teacher, Feb. 2011, Volume 49, Issue 2, pp. 127. Fullerton, Dan. APlusPhysics: Your Guide to Regents Physics Essentials. Webster: Silly Beagle Productions, 2011. Print. Fullerton, Dan; and Bonner, David, "Additional Crime Scenes for Projectile Motion Unit," The Physics Teacher, Dec. 2011, Volume 49, Issue 9, pp. 554-556. Fullerton, Dan. Honors Physics Essentials: An APlusPhysics Guide. Webster: Silly Beagle Productions, 2011. Print. Fullerton, Dan. Physics: Fundamental and Problem Solving. Webster: Silly Beagle Productions, 2012. iBookStore. Fullerton, Dan. The Ultimate Regents Physics Question and Answer Book. Webster: Silly Beagle Productions, 2013. Print. Fullerton, Dan. Utilizing Technology to Support Differentiated Instruction. Science Teachers Association of New York State Conference, November 2013. Presentation. Fullerton, Dan. AP Physics 1 Essentials: An APlusPhysics Guide, 2nd edition. Webster: Silly Beagle Productions, 2014. Print. Fullerton, Dan. Teaching Orbital Mechanics and Newton's Laws with a Video Game: Kerbal Space Program. Science Teachers Association of New York State Conference, November 2014. Presentation. Fullerton, Dan. AP Physics 2 Essentials: An APlusPhysics Guide. Webster: Silly Beagle Productions, 2015. Print. Fullerton, Dan. Developing a Successful Flipped Classroom. New York State Master Teachers Conference, May 2015. Presentation. Fullerton, Dan. The AP Physics C Companion: Mechanics. Webster: Silly Beagle Productions, 2017. Print. Fullerton, Dan. The AP Physics C Companion: Mechanics (full color edition). Webster: Silly Beagle Productions, 2017. Print. "I loved physics each and every day that I came in, and every night at the dinner table we talked about some sort of physics." "His communication w/students was excellent." "Class was interesting every day." 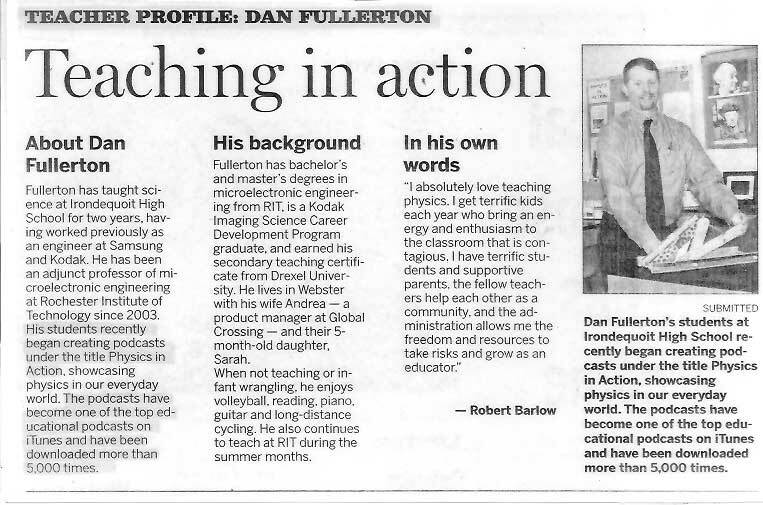 "I like how interactive Mr. Fullerton is with his students. It makes us feel ten times more confident." "I like the way the material is related to the real world... it made it so much more interesting than the past years of science for me." "I really enjoyed the class as a whole." "I learned a lot and understood everything." "I loved how we used the website, it really helped when we were sick." "This class is great. I can't think of anything bad, and I'm looking forward to more physics next year!" "One of the best professors at RIT, with an actual passion for teaching." "This course has been, by far, the best class I have taken at RIT. The material was relevant and presented very well." "Practical way of presenting the material... among the best at RIT." "Excellent presenter, great relevant homeworks and only emphasized what was important." "Very enthusiastic; good real industry knowledge." "Very organized, friendly, and helpful." "I would suggest the department offer him an office space, so we can see him around more often." "I enjoyed the way the instructor presented the course material and explained every detail, making sure we understood the material with every presentation." "Usually Powerpoints don't work very well, but this class has changed my mind on that." "I interviewed for the position and most of the technical questions were directly from the objective slides of your presentations. It's really all thanks to you and your presentations that I have secured this position." "Gives you every opportunity to help understand, internet, extra help, games, demonstrations. Has a great sense of humor yet makes sure everyone knows how to do everything." "I liked learning things that helped explain the world and how things work." "To be honest, I felt like this class was perfect. We had a good amount of notes, labs, and opportunities to catch up." "I liked the times when we had to learn for ourselves." "Physics in Action podcast is awesome!" "You're an awesome teacher. You take every student and treat them differently and see us as who we are." "I like being able to come in and get the attention and help I need. I learned 10 times more in here than I did at ____ in physics." "I didn't like it when you didn't answer some questions... but it made me grow up!" "I really really love this course because it is so well organized." "Always available for extra help." "Physics was awesome! I like how you adjust your teaching style depending on how we understand the material, and don't just follow a set lesson plan." "Physics in Action rocks! Don't change a thing!" "Amazing job! Lots of fun!" "Taught me well, helped out alot with the homework. Assigned lots of homework on the internet which was cool." "Great Teacher! Really helped me understand everything." "I loved all of the different activities we did throughout the year, the group labs, the podcast, the wave, iPod speakers, ..."
"This course really helped me understand what went on during my co-ops." "One of the best teachers in MicroE."